The stones have been cast, the votes have been counted, the public have spoken - and been heard - and our expert panel of staff have lent credibility to democratic opinion. Yes it has been a long process, with much deliberation, but Cracow Life is finally ready to reveal - in the categories of Eat, Sleep, Drink, Shop and Culture - our Ten Best Places in Cracow awards for 2006. What is the inspiration behind these accolades? The answer is simply: to reward excellence. Excellent products, excellent service and excellent ideas. As a barometer of all that goes on in the city, we at Cracow-life.com feel it's our responsibility to point our readers in the direction of the very best Krakow has to offer. In other words to point people towards those places which time and time again have offered superb experiences to everyone that has eaten, slept, drank and shopped at them. With our Ten Best recommendations we are giving visible recognition to those businesses. Just look out for our bright green and white stickers saying 'Best Place 2006' and you know you've found one! 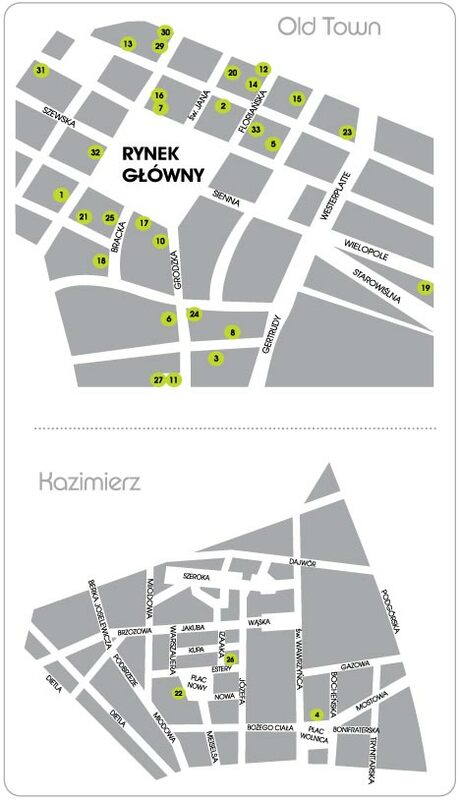 Don't forget then to exercise your vote and place a review on Cracow Life. Simply search by the relevant category and then press the review button at the bottom of the page to add your comments. Remember too, that at any place bearing a Ten Best Places in Cracow sticker is also a hotspot where you can pick up one of our free maps to the city. Folia cocnept club suxx, really. Just a small basement club. Thanks for reading, Ralph. The "Best Places 2009" are for 2010. Those were the best places of the past year. You'll find a link to it above right. Cheers. Any plans to update some of the guides to 2010? I noticed Szara has been chosen as one of the best restaurants, and I'm not that suprised - I like to go there every time I visit Krakow. Food is really top notch and the service pleasant. The location, of course, could not really be better! ALCHEMIA JEST SUPER I JEDYNA W SWOIM RODZAJU !!! very good list, thanks for saving my time ! Bit surprised that you didn't nominate Del Papa Restaurant - it's really very good indeed! Copernicus is a good choice, but why no Hotel Stary? Otherwise, overall I'd say these are pretty much the pick of the bunch. chyba szukaja, skoro na liscie sa knajpy poukrywane w piwnicach i na wielopolu 15 ..... a takie budda bary to sa na calym swiecie i moze dlatego nie jest to szczegolna atrakcja dla przyjezdnych, dziwne tylko ze nie wybrali ani jednej pizzerii ??? moze z tego samego powodu ? a dlaczego tu niema DYMu przeciez to najlepsza knajpa w miescie.....lubie tez PAUZE i tez ich tu niema, dlaczego pauza jest gorsza od CIENia ? Great idea ! You have chosen my favourite places! BRAVI!!!! UN BEL RICONOSCIMENTO PER UNO DEI MIGLIORI RISTORANTI A CRACOVIA "AQUA E VINO"...IL BUON LAVORO PAGA SEMPRE...O QUASI!